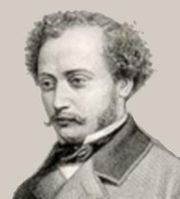 Alexandre Dumas fils (French = son), so called to distinguish him from his famous father, was born in Paris, the illegitimate child of novelist Alexandre Dumas and Marie-Laure-Catherine Labay, a dressmaker. His father legally recognized him and ensured that he received the finest education. French law allowed Dumas père to take the child away from his mother, and her pain at this loss influenced his writings. He also accompanied his father on many of his travels, including to Spain and Africa. In 1844, Dumas fils moved to live with his father at Saint-Germain-en-Laye. There, he met Marie Duplessis, a young courtesan who would become the inspiration for his now-classic romantic novel La Dame aux camélias (The Lady of the Camellias). He adapted it into a play called Camille in English, and it became the basis for Verdi's 1853 opera, La Traviata. Camille launched his career as the premier French playwright of the second half of the 19th century. In 1864, in Moscow, Dumas fils married Nadezhda von Knorring, whom he had met in Paris while she was married to her first husband; they had two daughters. After Nadezhda's death, Dumas remarried to Henriette Régnier de La Brière in 1895. He was admitted to the Académie française in 1875 and in 1894 he was awarded the Légion d'honneur. Alexandre Dumas fils is currently considered a "single author." If one or more works are by a distinct, homonymous authors, go ahead and split the author. Alexandre Dumas fils is composed of 58 names. You can examine and separate out names.